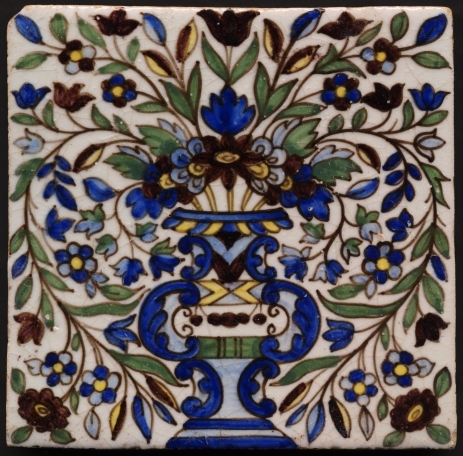 A bold true Arts & Crafts tile in the Iznik (Anglo-Persian) style, the design characteristic of the aesthetic movement and very reminiscent of William de Morgan's 'Persian vase' pattern. True arts and crafts manufacturing entirely done by hand similar to William de Morgan tiles, hand made buff clay body, tin glazed, hand painted and then lead glazed. Rarely does a complete and not repeating design so fill the tile, especially a hand painted design with this complexity. Having been able to compare three of these tiles it is clear that they are free hand painted without the use of stencil or pounced outline. A super range of colours, the bright blue characteristic of good tiles of the period and the pink somewhat unusual. The back is unmarked and has a thin residue of mortar. The tile is a little thicker and of denser clay than most tiles of the period, the edges are also undercut so that there were no gaps between tiles when laid, truly a quality made item. Chip top left and glaze chip bottom right corners, other tiny chips/roughness to the tips of the edges although most visible marks are manufacturing flaws. A short hairline (less than one inch) from the middle of bottom edge. The surface condition is near perfect, again visible marks are manufacturing flaws in the nature of handmade tiles. A very clean, colourful and bright tile. The image is full size at 72 dpi (about 430 pixels wide) in maximum quality JPEG format. A larger 120 dpi image also in maximum quality JPEG format can be forwarded by email if required. The image is a little oversize rather than cropped close to the edges so that the edges can easily be seen and any chips etc can be quickly spotted. Other marks described are usually not visible at all when the tile is viewed straight as one normally sees it and can only be seen with a critical eye when the tile is tilted to catch imperfections in reflected light. For more details of how we describe marks see Condition. Use this Universal Currency Converter to see current dollar price and convert price to other currencies. Only twice had I have seen this pattern until 2007, this is one that I bought in a local junk/antiques shop in the Black Country, Cradley Heath or Lye areas, back around 1980. Later I saw this pattern again I grabbed the opportunity of buying the few tiles on offer, in different colours with pink rather than blue being the dominating colour. I was hoping that these would help with identification and they did, unfortuantely there was no hidden Wm de Morgan mark but on one there was a rubber stamp mark, as commonly used around 1880 - 1910, which says 'Holland'. It can be identified as being made for export to the British by the dimensions, 6" x 6" being the British standard size compared to 125mm x 125mm (~5" x 5") the Dutch standard. *I believe it most likely that these tiles were made for Barnard, Bishop and Barnard, famous ironfounders from Norwich and associated mostly with the famous architect and designer Thomas Jekyll. BBB's ironwork is justifiably famous, they did works for many prestigious clients and exhibited at major exhibitions in the late Victorian era. BBB made many architectural ironwork structures for the City of Norwich, including a Pagoda and Bridge both designed by Thomas Jeckell. BBB exhibited at the International Exhibition of 1862 and the 1876 Centennial Exhibition in Philadelphia. BBB are also famous for designing and making cast iron lawnmowers. BBB had tiles made to their designs by various companies most notably William de Morgan & Co, and Mintons China Works, William de Morgan's first major contract was to supply tiles to them. But just as William Morris had tiles made by subcontractors including de Morgan and in Holland so did BBB, many of their patterns originally made for them by Mintons China Works appear on blanks from other companies. Unfortunately the makers of these are unidentified and indeed the tiles made for them by Mintons China Works do not have the makers name verso but are clearly recognisable as being made by them. Tiles made for BBB have one outstanding characteristic, they specified thicker tiles, they are a full half an inch thick rather than the usually three-eights of an inch. Half inch thick tiles are occassionally found in hearths, Mintons China Works made tiles "designed for hearths for which an extra thick body is used" although the vast majority of hearth tiles we see in situ and removed are three-eights of an inch. Frankly there is little practical benefit in using thicker tiles, once properly fixed the thickness has little bearing upon the durability, it was more of a marketing point rather than a practical advantage. It is likely that this tile was designed for BBB by a notable designer and that after earlier production in England the manufacturing was sent to Holland where traditional hand made tile making skills were still strongly in evidence compared to in England where the overwhelming majority of tile production had shifted to industrial methods. Morris & Company similarly had tiles made in Holland. BBB's customers appreciated the qualities of hand made items and were prepared to pay the extra costs associated with them. *I am advised that the design appears in a Dutch book on tiles with the following information: The design is called Julfa (a city in Armenia) and the original design is still in the collection from tile producer Tighelaar in Makkum. The author suggested c1920 and that the tiles were produced for the London tile dealer Martin van Straaten of 28 - 30 Little Britain, London (current postcode EC1A) who ordered tiles from Makkum from around 1894.